Dustin Brown or Rick Nash: Who is a Better Fit For the New York Rangers? It was 32 years ago today that the United States hockey team completed the “miracle” by beating Team Finland 4-2 to win the Gold Medal at Lake Placid. In trying to relive the magic (even though 1980 was 12 years before I was born), I decided to watch ‘Miracle’ last night, and one of the lines that always stands out to me is when Herb Brooks, played by Kurt Russell, tells assistant coach Craig Patrick, “I’m not looking for the best players, Craig. I’m looking for the right ones.” In assembling that team of kids that won the Gold, Brooks didn’t compile the twenty best amateur players in the U.S., but rather the twenty that as a group had the best chance to win. So, how does this clip from a movie relate to the team currently with the most points in the Eastern Conference? Well, according to multiple sources, the Los Angeles Kings have been entertaining offers for their captain Dustin Brown, and according to Chris Botta, the Rangers are one of the teams interested. 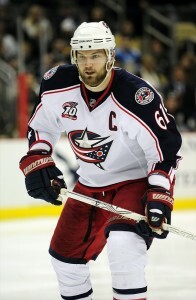 At the same time, Rangers’ GM Glen Sather is working to get a deal done to acquire Rick Nash from the Blue Jackets. Offensively, there is no dispute that Nash is the better option. Although Brown has scored at least 24 goals in each of the last four seasons, Nash’s worst single season goal total in the last four seasons was 32, and that doesn’t include his career high of 41 goals in 2003-04. However, there are pitfalls to making a trade for Nash, as there are two hefty price tags attached. One is the contract for Nash ($7.8 million annually through the 2017-18 season), and while it is doable with the salary cap, it would still handcuff the Rangers going forward. The other hefty price tag would be the package the Rangers would have to give Columbus in order to acquire the Blue Jackets’ captain, a combination that would likely include Brandon Dubinsky, two prospects, and a 1st round pick in the upcoming draft. Brown would be a cheaper addition in both of those categories. Brown’s contract carries a $3.175 million cap hit for the next two seasons, and if the trade involved Dubinsky and a prospect, the Rangers would actually have more cap space. But, that’s not the only reason why Brown would be a good addition in New York. John Tortorella has talked about creating an “identity” for a while, and how the identity that the Rangers have created has been the main reason why the team has had the success they have had this year (although world-class goaltending from Henrik Lundqvist sure helps). Brown might not have the goal scoring ability of Nash, but he plays big minutes in all situations (even strength, power play, penalty kill). It’s too simplistic to say that he is a slightly bigger version of current Rangers’ captain Ryan Callahan, but the styles that they play are very similar. No matter what happens in talks with Nash, if the Rangers can find a way to get Dustin Brown, they need to make a move to get him. It’s about getting the right players, not the best ones.